1). 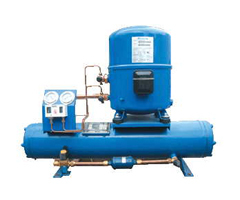 The units use Danfoss Maneurop hermetic refrigeration compressor, with large inner volume, which can prevent liquid strike. 2). High efficient water-cooled, tube and shell condenser with high heat exchange efficiency and long life span. 3). The units is with good domestic accessories, as filter, solenoid valve, pressure controller, and high and low pressure meter etc. 4). MT series water-cooled condensing units.